Always travel with fishing gear: Big moon. Big mouse. Big fun. Big moon. Big mouse. Big fun. 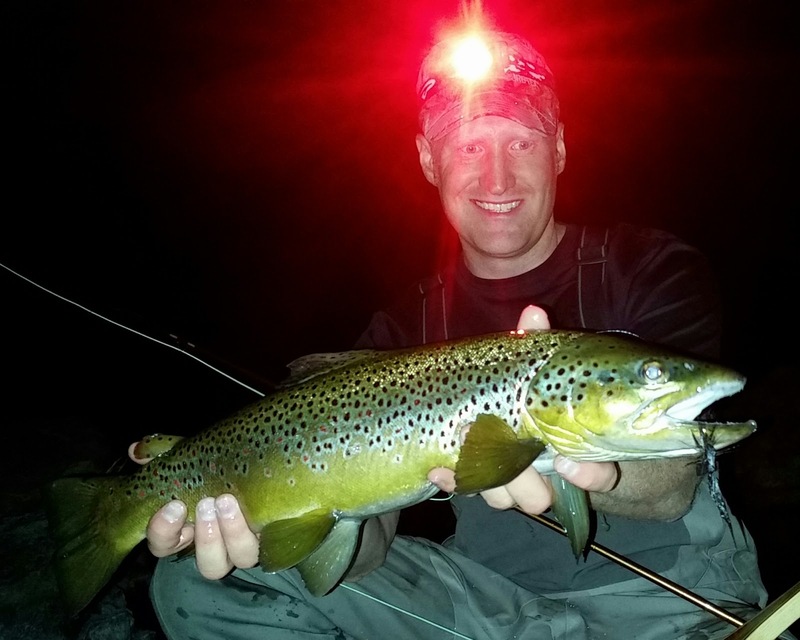 A major goal of mine for this year is to do more night fishing than I usually do. Rather than let it be haphazard, make it a priority. All the full moons of the year are marked on my calendar. I hope to make at least one trip per moon between now and winter. The first moon of summer just occurred - and I had been anticipating it's arrival. It roughly coincided with the July 4th holiday weekend, so I figured that surely I could squeeze a night or two out of it. As it happened, we attended a July 3rd fireworks show in Butte, MT. Butte traditionally fires them off on the 3rd. After arriving home and tucking the family into bed about 1am, I loaded up and headed to the river. More than half the night was already gone, but I still had two solid hours of moonlight before the sky would start to glow again. The moon was only a day into waning and the mountains were glowing ashy white. I eagerly made my way along the river, searching for some boulders I knew held browns. 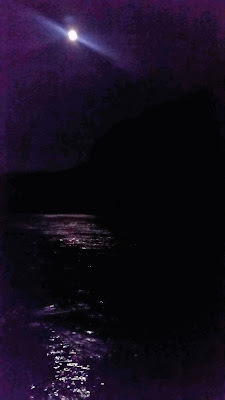 They weren't hard to spot, glowing white against the black water, murmuring and roaring off the canyon walls. The air was still. The temps had barely dipped into the 70s after a high of around 100 for the day. Perfectly pleasant and wonderfully ideal. I came prepared to experiment with several techniques, but what I really wanted to do was mouse. After a couple hundred yards of picking my way along the shoreline I zeroed in, stowed the second rod behind me, and focused on working a mouse. The first hit was like electricity. I'd long ago lost any sense of being tired. As soon as I'd slipped into my waders and cinched my boots I found a second wind. But now my senses were abuzz. 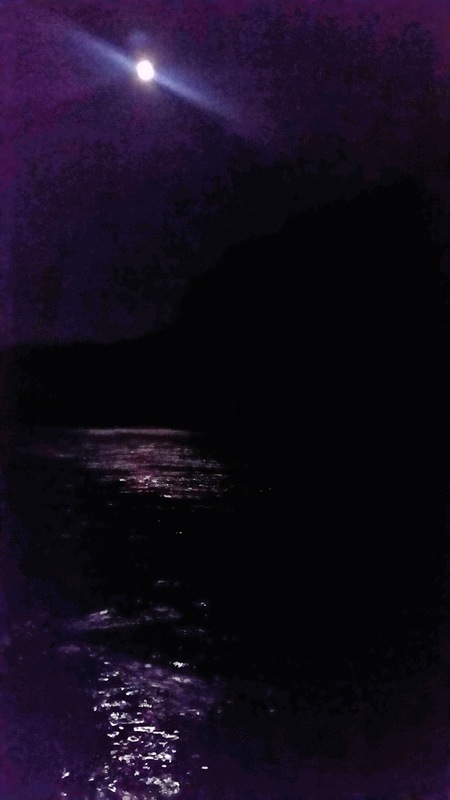 When fishing at night you become so in tune with senses that you normally don't rely on. Listening for the hit. Deciphering what little bits of movement and trails in the water you can see. Letting your fingers glean more from what is telegraphed through the line where your eyes might have taken over before. Trusting that your imagination teamed with your skill is really putting your fly where you think it is and making it do what you think it's doing - more than just a shot in the dark. When the hit happens all of that slams together into a sensory overload that makes your heart want to explode. I may have been on a second wind, but the first hit sent me to a heightened level of alertness and anticipation that you can't manufacture on your own. It takes the jump-starting jolt of water erupting in front of you on what you know is your fly. I'd missed the fish. Didn't even feel it. Maybe it missed me. But it was exactly what you are looking for at night - the kind of explosion in the water that only a big nocturnal brown makes when he thinks he just found a steak dinner. Whatever little bugs were hatching were just tossed aside by the rolling wake as the mouse was sucked under and lost in a sea of white foam. I moved on, no longer questioning whether the fish would be in these rocks. Browns are browns. When they like a spot, they like a spot. If one was here, almost certainly there'd be more in similar positions. I keyed in on slots similar to where that one had been. As the next six hits proved, they were holding close to structure in relatively shallow water. The banks were crawling with raccoons. The noise of their busyness among the rocks and scrub was seemingly constant. I nearly stepped on a young one once. Had to shoo it off the boulder we were sharing so I could move on. I flipped my red light on at one point and counted six at once in the reach of my glow. Bats too, were everywhere. I fully predicted that I'd hook one before the night was out but never did. They constantly were running into my line and swooping at my mouse. The distinct tap of them bumping the fly line was like a fish pecking a jig, and I had to train myself not to react. Something about the click of the fly reel drove them crazy, and whenever I gathered line back on they'd concentrate like moths on a bug zapper, all over my rod and face, then dissipate when the reeling stopped. I finally connected with a hit that stuck when I plopped the mouse alongside a boulder and let it dead drift to the downstream side and into the eddy behind it - or at least that's what I envisioned my fly doing. When I supposed it was in the eddy, I gave a couple twitches and it was promptly engulfed in what was one of the least explosive strikes of the night. The brown showed himself immediately by going into a series of jumps and kerplunking belly flops. He didn't bulldog his way back down into the boulders like they so often do. He mostly stuck near the surface and made a couple strong tail-walking runs. I set my tripod on a rock behind me and deployed my net. It was a smallish net. Most any net I have of appropriate size isn't easily carried. I folded him in just fine though, head and tail sticking out of opposite sides. I gave him a quick lift to the camera, shouted a voice command three or four times to trigger shots, and then slipped him back in the water. It was only then I realized I'd forgotten to turn my headlamp off. The only pic not completely washed out in red light was one where I was looking slightly down toward the fish. As I got my gear back together I noticed the first light of dawn. It came quickly, and the bite shut off as the stars faded away. Regular surface activity picked up as rainbows started sipping bugs. I envisioned the big browns slipping back to the depths for their daytime holding routine. I might have only landed one, but I'd accomplished what I set out to do. Over the next few days I got out twice more on two different streams, but never hit as clear and still of a night. 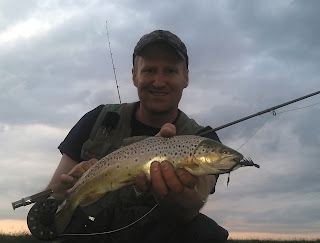 I landed a couple smaller ones and lost a couple other brutes to broken tippet. I hate breaks.... but I've got four more full moons before November to try and redeem myself.